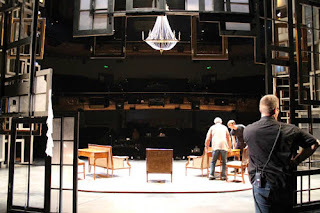 An actor's view of the house with techies installing scenery. Coming from a computer science and theater background my perspective of the design process is multifaceted. I see the descriptive metadata of the set's components alongside its process details and artistry. Wielding a camera instead of a keyboard for a few days, I saw firsthand how attentively A.C.T. 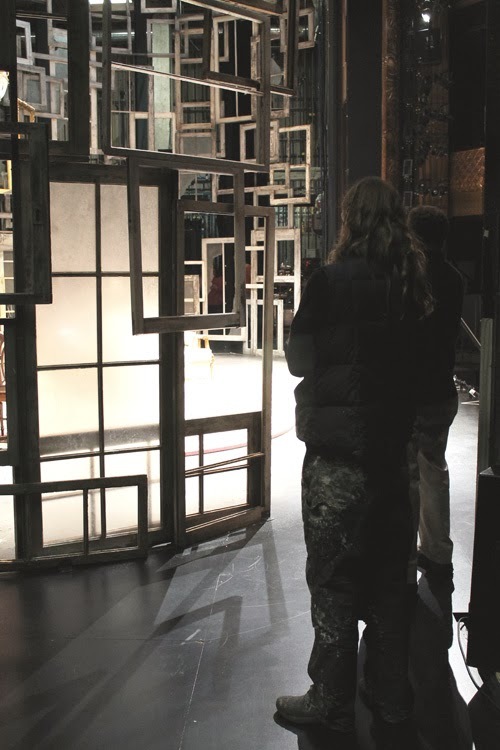 works with its set designers and scene shop. 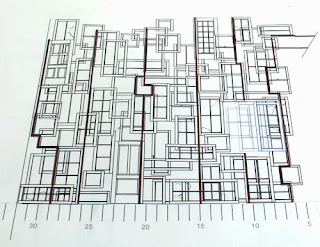 Draft of stage right frame section. Click here for more photos from the scene shop. Tripping over my shoelaces from looking through the camera, I see frames piled up all around the shop. It is clear to see how Dan Ostling's notion of 'lived-in' is being incorporated into the nature of the materials; the frames have been resourcefully salvaged from around the Bay Area. The scene shop employs some of the most talented makers in San Francisco—these artisans are the last to say something is not practical. Their tenacity makes the construction of the one hundred and fifty window and door frame main background piece, a reality. The shop foreman hints at the complexity of determining the curve needed for the metal posts in each section of the concave frame structure. 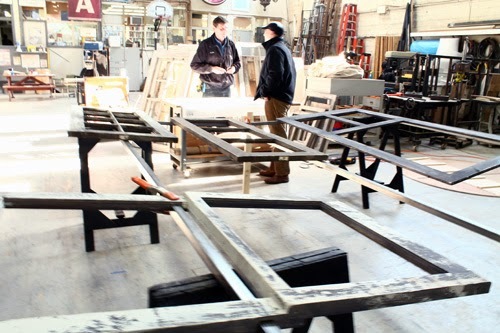 In the main pathway of the shop, a section of the frame unit sits askew atop sawhorses due to its curvature. To the right, carpenters are putting together the oversized "BLOOD AND FIRE" Salvation Army emblem (now hanging downstage center). Further up the path, scenic artists are cutting out a medley of stencils for the Persian style rug. I see the soon-to-be set take up most of the floor space, the paint deck holding a newly scumbled (a particular way of painting), haze flooring. 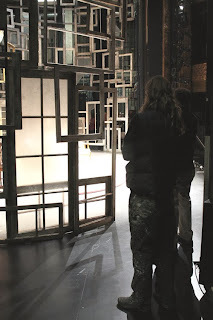 Venturing into The Geary Theater, I see the set awash with color and hear random sound tests. Standing in the wing, the concave structure of frames looms overhead. 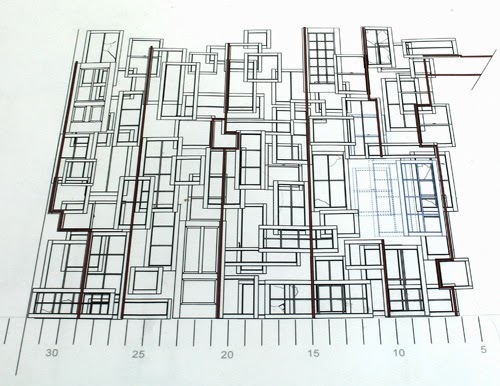 The set seemed a facsimile of the renderings and model. 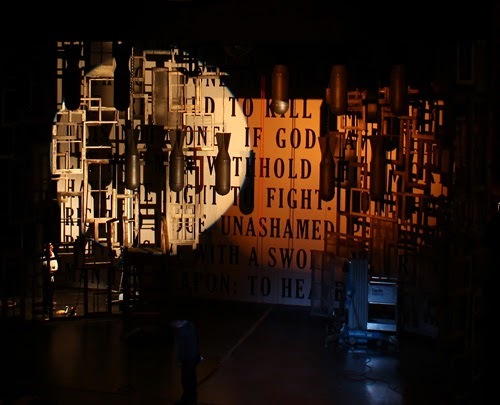 Smaller parts of scenery are sitting on the side lines while lighting assistants focus lights from all areas of the theater, from the Genie (a lift) onstage, to stage hands precariously leaning over the balcony railing. Behind the set of frames hangs a backdrop bearing strategically arranged and, at first sight, striking words. Soon I see lighting assistants twirling a spiral stair unit stage right, posing as actors in order to focus the lights. While walking among seats of the orchestra and sitting awkwardly on steps and rails on upper tiers for photos, I notice stage hands and run crew flying in new scenery, quickly zipping them back up to the grid as operators finish lighting them—causing me to have awkward lighting and blurs galore in most of my shots. I count about seven different linesets being used to hang faux weaponry, gilded frames, the now fully painted emblem I had seen half-constructed, and a peculiarly shaped chandelier. During such a busy day, being one of the last before runs, I met with the assistant production manager. This time I walk in to find three times as many people bustling through the theater, onstage, backstage, and under the stage (trap). Touring downstairs momentarily to see the spiral stair continuation of the trap, I return to see candy-striped settees, side tables and a velvet armchair (they work fast!). Circumambulating the set is the director, Dennis Garnhum, giving notes to the techies, while furniture is being secured. Only one day has passed since my last visit and the set has become rich and cohesive. 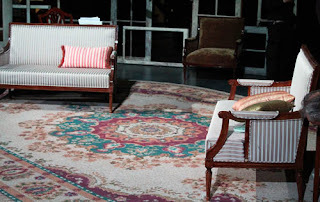 I notice the Scenic Charge Jennifer Bennes examining the set for paint touch-ups from the wing. It is not always the case that a set is complete when installed, some parts of a set design (like the balusters) have to be done in situ because of the transportation and install process. Noticing the intricacy of the finished rug, she explains to me the process of creating it. The rug used four hand-mixed silk dye hues (cranberry, gold, olive, and peacock), eighteen stencils, and a slurry of cutout petals—about fifty hours of work with two other scenic artists (B.J. Fredrickson and Letty Samonte). Detail shot of Persian style rug. Click here for more photos from tech. Because design motifs of the rug repeat, the stencils were reused after each spray. The painters also used shapes for hold-outs. Jennifer explains: "a hold-out is when you put a shape onto the rug, in [this] case, stickers and shapes cut from craft punches with glue applied to the back, and then spray a color over the area with the hold-outs. 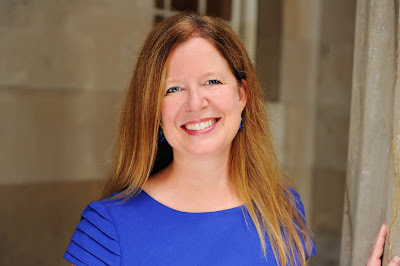 When you remove the hold-out, you have a shape like a flower or a leaf within a color field." With three-hundred photos accumulated to sift through and process, I double back to confirm the details of what I had seen onstage and in the shop. A.C.T. 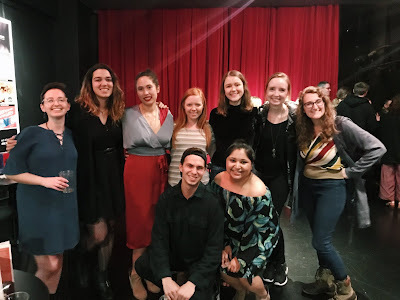 is a fairly small company for the quality of theater it produces, which leads to one of its best qualities—accessibility. Soon I'm emailing across departments to confirm deatils of the set, painting and lineset schedule. Because some photos were taken during focus (a stage in the tech process), most of the phrases were occluded by the foreground of the set and lighting. After piecing together parts of images I discovered they are actually notable lines spoken by Undershaft in Act III Scene II of Major Barbara. The lines reveal how the governing perspectives of the previous Undershaft owners of the munitions factory, changed with time. Pay attention and you will notice the lines are actually out of sequence! I also discovered that my lineset count was slightly off. From the house I had seen seven linesets used, when in fact there are around ten. These details are just some of the few, one would not notice during the timespan of the show. the set in contrast to the theater. As a computer science student and web fellow, the set seems an arrangement of measures and dimensions, the metadata of the objects in time and space. As an architecture student it boasts unfathomable form and structural integrity. (Note: theater is one of the most strict in following safety guidelines.) As a painter, it displays a combination of precise technique and patience. 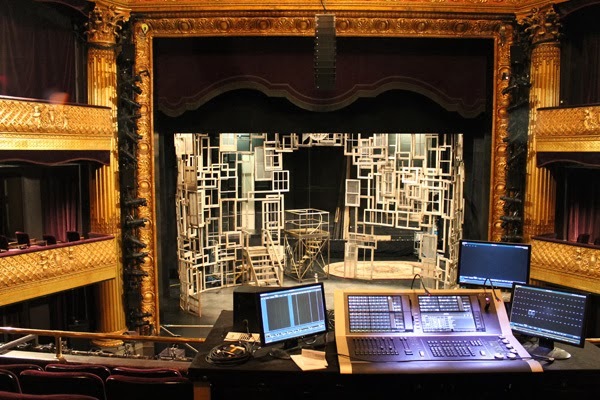 As a set design assistant, it's a magical and precarious arrangement of inventions which create an environment for each performance of the show to live. Major Barbara is indeed a set to inadvertently enthrall from countless perspectives giving you the chance to imagine what this show is actually about. Click here to buy tickets and learn more about Major Barbara. Click here to see more photos from tech week. Click here to see more photos from build in the scene shop.